HUNDREDS of pubs facing closure will be thrown a cash lifeline under Tory plans to support struggling communities. A special £1 million fund will be set up to help local people launch takeover bids to keep their boozers open. Environment Secretary Elizabeth Truss told me of the plan over a glass at one of Westminster’s favourite watering holes. The move is part of a package of measures to boost rural areas to be unveiled in the Conservatives’ election manifesto. It would help protect up to 600 pubs which act as community hubs from being knocked down for developers or turned into housing or takeaways. Tories will set up a “Last Pub in the Village” fund to help locals step in to save their favourite watering hole. They will be able to apply for loans to pay for legal fees needed to stage a takeover or win a protection order. 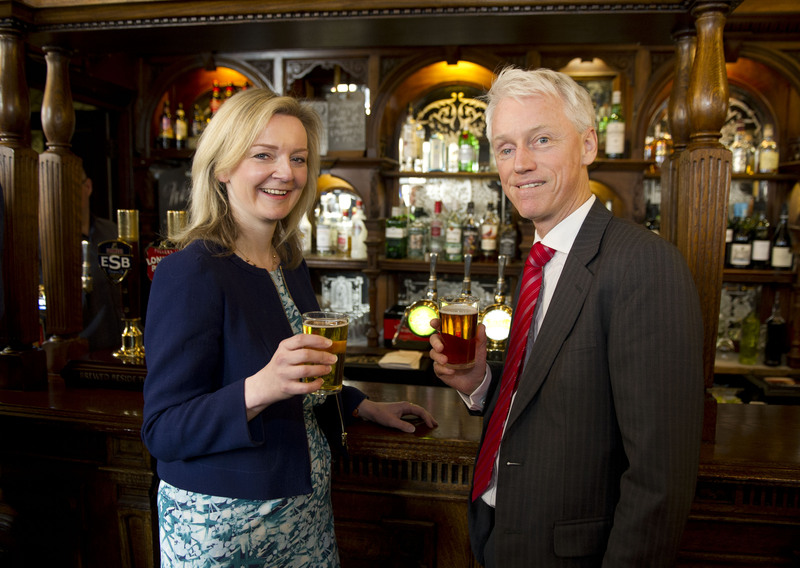 Ms Truss said pubs in rural areas also act as job centres, information hubs and the backbone of sports teams. She said: “Pubs can be a cornerstone of a community, especially in rural areas where they become an important focal point. “People form lifelong friendships in village pubs, which bring people from all social backgrounds together. Ms Truss said a future Tory government would also impose a five-year freeze on licence fees for small community pubs – helping to cut their overheads. She has by a community rescue of the King’s Arms, at Shouldham, Norfolk, where villagers bought shares in the pub and volunteers carried out a refurb. It is now a thriving community hub which provides school meals for local kids and serves pub grub in the evening. Sipping a glass of cider in the famous Red Lion on Whitehall, she added: “We’ve already done a lot for the great British pub by cutting beer duty three years in a row. “This has protected an estimated 16,000 jobs and we want to build on that in the next parliament. Last night the plans were welcomed by the pub and beer industry. Keith Bott, managing director of Titanic Brewery, in Stoke-on-Trent, said: “This would be a massive boost for the pubs which are part and parcel of the British way of life. “Hundreds of them are struggling so it is vital to do what we can to protect those which are an asset to their local community. This entry was posted in Conservative people, General Election 2015 and tagged #GE2015, beer, Community pubs, Conservative manifesto, Conservatives, DEFRA, Elizabeth Truss, Environment Secretary, general election, Keith Bott, King's Arms, King's Arms Shouldham Norfolk, Last pub in the village, Liz Truss, pub licence fees, pubs, Red Lion, Titanic Brewery, Tory manifesto, Whitehall. ← When political prejudice is all in the mind.